I asked a month ago if the era of CAPCOM-sponsored Ace Attorney Nintendo eShop sales was over, ‘cause there weren't any for Black Friday. Sale from December 22 to January 4. There isn't a better time to get into the Ace Attorney franchise, which is of course all I care about. Phoenix Wright: Ace Attorney — Dual Destinies is 60% off. Phoenix Wright: Ace Attorney Trilogy is 50% off. We're used to massive discounts for those. However, four months ago I said the most these have ever been discounted were 60% off and 45% off, respectively. It's a tie for Phoenix Wright: Ace Attorney — Dual Destinies, and a NEW RECORD for Phoenix Wright: Ace Attorney Trilogy. What was the occasion for a sale four months ago? The release of Phoenix Wright: Ace Attorney — Spirit of Justice, a game that I believe is the best game released in 2016. (Will it win KoopaTV's Game of THAT Year award? Stay tuned to KoopaTV to find out.) It's now 33% off in the Nintendo eShop. That marks the FIRST EVER discount for Phoenix Wright: Ace Attorney — Spirit of Justice! Kody B.! With a lot more articles with broken video embeds on his list than the other candidates. Including many that I don't even want to revisit or have no idea what was even embedded there, which suggests to me that perhaps KoopaTV should work on how it introduces embedded content. Y'know, like providing context instead of just dumping content on you. At least this article's message is clear and has no videos in it: Buy Ace Attorney games on sale! Because the sale ends January 4, KoopaTV should be able to send out the prizes for Round 11 of the KoopaTV Loyalty Rewards Program, which should hopefully fund even more Ace Attorney-related prizes (or anything you want). But... will there even be non-attorneys-who-wish-to-become-attorneys who will win? Time will tell. Really shortly. If you're really poor and don't believe in e-commerce for some reason, but still want to play games, check out KoopaTV's latest videogame release, The Wonderful 1237! And by latest, I mean the previous Friday. It's an absolutely free AND excellent flash game! This article exists because Ludwig only had less than an hour to write an article, and because KoopaTV has covered every other time Ace Attorney games have gone on sale. He spent the weekend being Scrooge and didn't work on a single KoopaTV-related thing. Whoops. 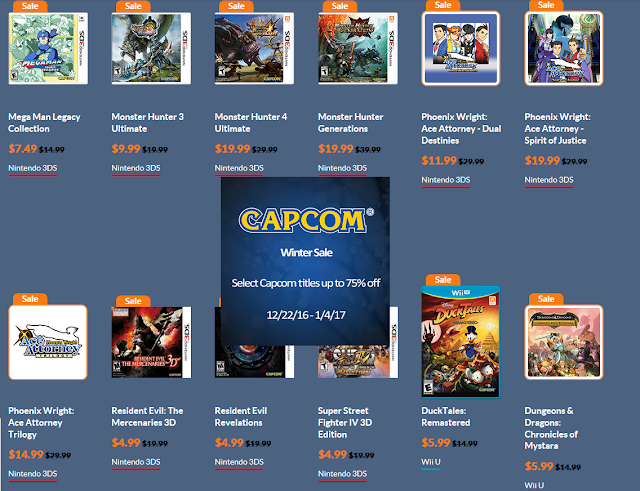 CAPCOM had a Holiday Sale at the same time back in 2015. Some prices are more, some are less, some are the same. For more information about the trial that occurred in real-time while this article was written, click here. The next sale for Ace Attorney games has the same amount off, except Spirit of Justice is at 40% off. It also takes place during a Phoenix Wright trial. After apparently skipping 2017, the Winter Sale returns in 2018. I know that you just searched "video" or "Rawk" in KoopaTV's search field or whatever to try and find stuff. I dunno wot he did, but unfortunately that which you did obviously didn't cover a ton of stuff compared to wot he did. I did "movie" only, I believe, as well as maybe "Youtube." If he went through literally every article here then that is impressive. Which is literally a list of embedded OST videos. That is exactly what I did and thanks. Actually can't remember if I used "movie" or video." May I just say I appreciate the way KoopaTV conducts contests. I entered a contest on Facebook which depends on the number of likes one receives for an image. Of course if one never built up "friends" over the years, they will not cut it with likes unlike someone who can easily ask for them. At least with KoopaTV, we get judged instead or like the finding dead video contest, it depends on how much effort we exert. ...Yeah, you may say that. Effort & skill rule the day, not luck or patronage! I have seemed to see the Ace Attorney games on sale quite often, Capcom seems to jump at an opportunity to put them on discount. Not that that's a bad thing! Nintendo themselves needs to refine their art of discounting, as evidenced by the pretty meh My Nintendo rewards that they seem to think are good discounts. Not quite! Well, I always mention whenever it's on sale on this site, and I don't do that for any other game series. Good connection back to My Nintendo! When I said that there wouldn't be any broken embeds on left on the site, I really meant it. It took hours upon hours to go through every section meticulously searching for any video and image I could find. In the end, all of the time spent was worth it. With this eShop card, I will finally be able to pick up Spirit of Justice! Now that definitely IS worth it. Very good work.